Changing attitudes about math…one teacher, one parent, one child at a time. The Internet can be a powerful tool for education. This tour will help us learn how to surf the net and take us to some Web sites that are designed to be mathematics sites for parents. 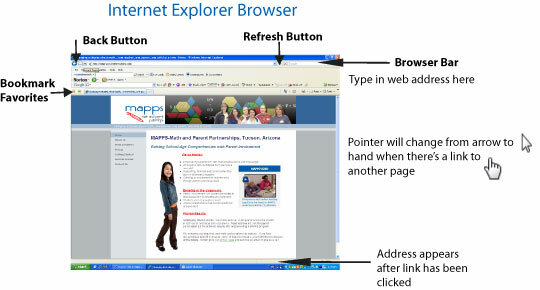 To visit different Web sites or pages within a Web page, you will move the pointer around the screen with your mouse until the pointer turns from an arrow to a pointing finger. By clicking the mouse on a link, you will be taken to a new web page. Once you’ve found a web site you’d like to return to, just click on the bookmark or favorites icon. The web page will be added to your list. Figure This! is a site for parents that was developed by the NCTM, the national math organization. This site has activities for grades 5-10 you can work on with your child. You will find a number of interesting problems. Click on Take a Challenge and work one of the problems. The answers are there but before you peek, try doing the mathematics. It is the process to the answer, not the answer that will make our children strong mathematically. Visit the NCTMs Family Corner for great links to parent resources. NCTM has also provided a new site called Illuminations which contains standards based activities and links to sites that have been reviewed by a panel of experts. The links and activities on this site can keep you and your child doing high quality mathematics for hours on end. No Child Left Behind is a government page by the U.S. Department of Education. ENC is another government educational site with loads of good math links. Sometimes we may need help with a particular math problem. We can Ask Dr. Math. To do so, click search the archives and type pi into search box and hit return. Scroll through the answers and you should find About Pi. Also the end of these articles have links to other information on the topic. This ends our tour. We hope you enjoyed all the sites you visited. If you would like to further explore, below is a list of recommended mathematical Web sites to visit. Keep in mind that technology is always changing and some of the Web sites listed may have changed their URLs (addresses) since this tour was created. To locate Web sites that hve changed, go to a search engine such as “Google” and search using the key words of the missing site. • Mathematics Lessons that are fun! fun! fun!